The time has come to start redeeming those "Free Friday" coupons that we've been posting! The first one is up this Friday, July 8! 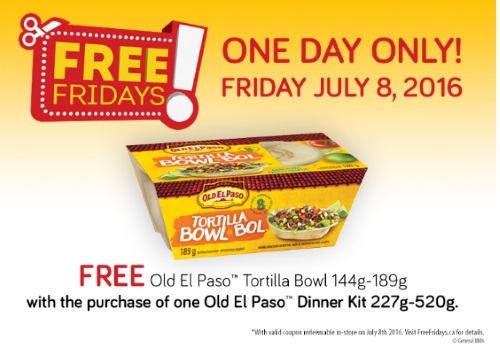 Redeem your coupon for a Free El Paso Tortilla Bowl (144-189g) when you purchase any Old El Paso Dinner Kit (227-540g). Please note, this coupon is only valid this Friday, July 8, 2016. Let us know on our Facebook Page if you are going to redeem it, or have redeemed it! Click here for the original post for this offer.